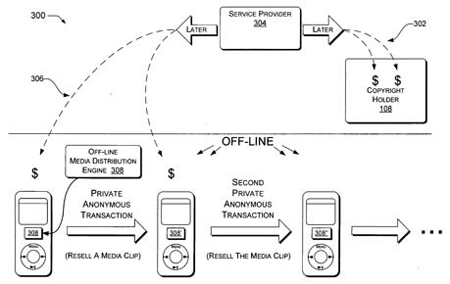 A recent patent application by Microsoft describes a mechanism whereby Zune users are paid for sharing songs. Currently the company’s digital audio player has the capability to wirelessly swap music with other Zune owners, with the restriction that any shared song can only be played a maximum of three times. After which you’re given the option to buy the track from Microsoft’s Zune Marketplace. In a move designed to encourage sharing — and in turn, sell more music — Microsoft proposes paying users a percentage of revenue from sales generated through tracks they’ve shared. But perhaps what’s most interesting is that the system works even if shared songs weren’t originally purchased from Zune Marketplace and, therefore, don’t use Microsoft’s DRM. In other words, DRM-free music that’s been downloaded from elsewhere — including pirated songs — still have the potential to be monetized through Zune to Zune sharing. That’s because, rather presumptuously, the Zune wraps its own DRM around every song that’s shared. Paying users for sharing tracks that subsequently lead to a purchase is an interesting concept, which at least shows some innovation in terms of how to convert piracy into legitimate music sales. However, with the music industry moving away from DRM and towards universal formats, the idea may have already expired before it ever hits market. I can get paid for pirated music? How many users are they talking about? 5? This will *never* work. Think about it. Without DRM there is no way to tell if an *.mp3 is legal or not. If they pay folks for sharing non-DRM’ed stuff, then any fool can get a living out of MS by simply swapping files around on the net. Crazy. So basically this would work in North Korea or some other Nazi-esque country. Is that an iPod ? To me, that looks more like an iPod nano than a Zune. @Jeremy: But people do buy DRM music through a DRM store. It’s called iTunes. The only cool thing about the Zune is sharing songs between Zune users. To bad Micro$oft nerfed the whole thing by restricting those shared uses to 3. Luca is right, I was about to say the same thing. It was a German company iirc. Their patent (assuming they had one) may well be sufficiently general that Microsoft’s could be shown to infringe on it. That’s actually quite nice, granted they still have DRM and that it only lets you listen to it 3 times, it’s still an improvement and the referral system is a nice change, ITunes would never think about doing this. Who will exploit this first?